Redshirt sophomore pitcher Jake Cryts recorded seven wins for the Bearcats last season. 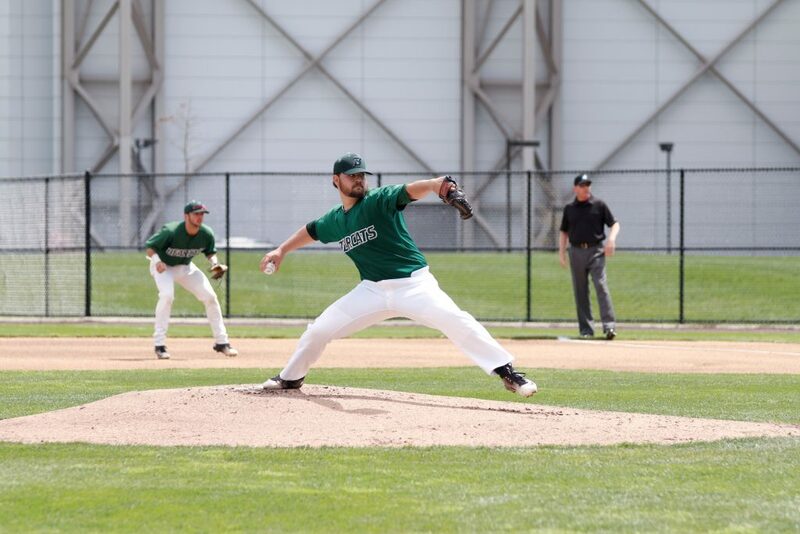 Late in nonconference play of what was beginning to appear as a lost 2016 season, senior catcher Eddie Posavec and senior first baseman Brendan Skidmore talked about the state of the Binghamton baseball team. Sitting inside of their hotel room in a SpringHill Suites near Philadelphia, Posavec and Skidmore grew increasingly frustrated at the Bearcats’ 2-13 start to the season. They knew BU was better than its record indicated, but couldn’t figure out why the team wasn’t playing up to expectations. With America East (AE) play set to begin a week later, Posavec and Skidmore realized that the Bearcats needed to change quickly. The last thing BU wanted was a repeat of 2015’s devastating last-place finish, which came just one year after winning the AE Championship. But all of a sudden, BU’s starting rotation — which had struggled mightily in nonconference play — hit its stride. The Bearcats’ bats heated up, and the errors made by its defense were few and far apart. BU won 25 of its 40 remaining regular-season games — taking the AE regular-season crown, and carrying its momentum to a conference championship. The Bearcats will now seek to repeat their late-season success and return to the NCAA Tournament, while looking to transcend the cyclical struggles they faced in 2015. BU will return to the field this season without five graduated players, all of whom experienced three conference championships in four years. Four of those players — second baseman Reed Gamache, third baseman David Schanz, starting pitcher Mike Bunal and closer Rob Hardy — held key roles in leading the Bearcats to their recent successes, leaving behind questions of who will replace their production on the mound and at the plate. Some of those questions will be answered by the impressive slate of returning players — six of whom were named to AE All-Conference teams, including junior center fielder CJ Krowiak, junior catcher Jason Agresti and Skidmore. It has not yet been decided, however, who will replace Gamache at second base and Bunal in the starting rotation. Sinicki was reluctant to discuss the decision prior to the start of the season. Third baseman Justin Yurchak, a redshirt sophomore transfer from Wake Forest, will also be expected to step up this season. Yurchak started 47 games for the Demon Deacons as a freshman before missing last season due to NCAA regulations. In 2015, he batted .313 and tallied five home runs, eight doubles and 33 RBIs before being named to the Atlantic Coast Conference All-Freshman Team. This year, BU will take its nonconference record with a grain of salt, using those games to evaluate players and improve on the field before AE play begins on March 18. AE coaches ranked BU No. 1 in the preseason poll. Last year, the Bearcats were selected to finish fifth. “What we’re going to try to do is get our guys to peak not here in February or March, but to play our best baseball in April and May, which we have a history of doing,” Sinicki said. The Bearcats are set to begin their season on Friday against New Mexico. First pitch is scheduled for 8 p.m. from Santa Ana Star Field in Albuquerque, New Mexico. The series will continue with games on Saturday and Sunday.